Feeding The Hungry Never Tasted So Good! Since the idea was first talked about over a cup of coffee, Fat Friar has been designed to support our existing ministry to the poor and marginalized on the Northside of Syracuse, NY. Currently the Assumption Soup Kitchen serves over 450 meals per day to our hungry brothers and sisters. All proceeds from Fat Friar sales enable us to buy necessary staples; meat, bread, condiments, and fruit, used to prepare meals 7 days a week. The soup kitchen has been in existence since the mid-1860’s when the Franciscan Sister’s of the Infant Child Jesus, first came from New Jersey to work on the Assumption Campus. It was their love of Christ in the poor that began this ministry we carry on today. By supporting Fat Friar, you are participating in a legacy of service and helping to ensure that it continues into the future. At the most basic level, Fat Friar is dedicated to offering local handmade gourmet treats to the CNY community. Everything we sell is made locally and utilizes all natural locally produced ingredients whenever possible. Fat Friar is also dedicated to serving the poor and the marginalized by supporting the operations of the Assumption Soup Kitchen. Order cookies as gifts, party favors, or treats for yourself and feel good knowing that proceeds from your purchase will help feed the hungry. When you purchase your cookies from Fat Friar Confections, you are purchasing the highest quality homemade cookie. We recently started selling Fat Friar cookies at The Franciscan Place, located in Destiny USA. 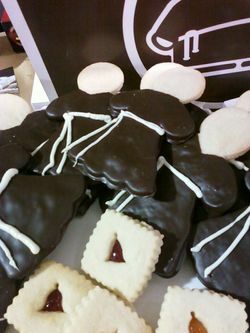 Each week we sell Linzer cookies filled will various fruit fillings and our traditional Fat Friar cookies, a shortbread cookie dipped in Swiss melting chocolate! The Franciscan Church of the Assumption, 812 N. Salina St., Syracuse, is home to Fat Friar Bakery. Funds raised benefit the Soup Kitchen and Food Pantry at Assumption.